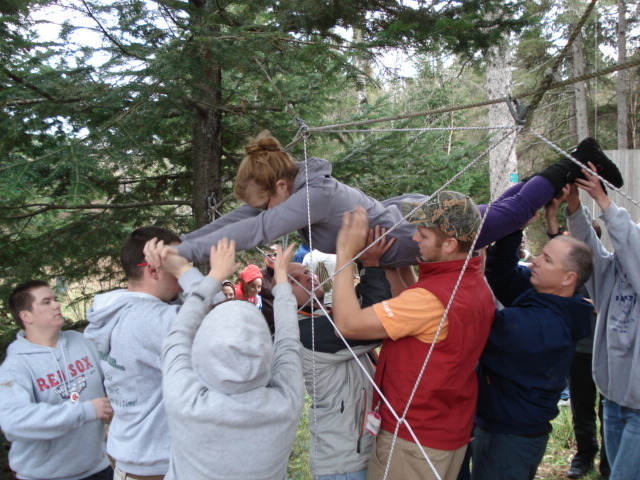 Participants ages 14 and up have the fun and exciting opportunity to learn team building skills as they navigate the elements and exercises provided by our Challenge Course, which includes high ropes and low ropes elements. Safety and security issues are always a major part of any challenge exercise but the philosophy is that YOU choose if you are going to take the challenge. Experiences beginning with two hours and going up to a full day are available and customized to meet your particular group or organization’s objectives. Outdoor Education Staff will meet with a group’s leader/s to customize each experience and meet the group/organization’s needs and goals. Descriptions for the Challenge Course elements are included in the link below. Indoor activities may include team building, adventure games, trust activities and initiative problem solving. Both inside and outside rock climbing with a certified climbing instructor can be included. The Challenge Course is available by arrangement through Gentile Hall in cooperation with our Outing Club and Recreation faculty. Please request this activity six weeks prior to your actual on-site event. The high ropes and low ropes elements are available in the spring, summer, and fall seasons. Indoor team building and climbing wall activities can be arranged during the snow-covered season. To make an official request, print the Challenge Course Facility Request Form and submit it to Gentile Hall. Each participant or guardian will need to sign an Assumption of Risk Form to participate; please click here to view our forms. In cases of requests from on-campus groups, the budgeting agent would need to also approve the request. Following approval, the instructor or facilitator for your event will be in touch with you to confirm the arrangements.